If you search for the word “tickets” on eBay right this second, you’ll receive 504,851 results. That’s half a million listings, being sold by hundreds of online ticket brokers. When I first started learning how to become a ticket broker, I knew my competition was fierce. I was a newbie and these sellers were weathered pros. At first, I didn’t know all the techniques they did and I certainly did not have all the connections they had. Stay laser-focused on providing value to your customers and the money will take care of itself. See, there are hundreds of people online trying to make money selling tickets, but a lot of them are just out there to make a quick buck. Many of them could care less about their customers as long as they get paid. And for some ticket brokers, this strategy works. For a while. But if you’re determined to have long-lasting success in the ticket broker industry, the easiest thing to do is to get your mind away from the profits and instead focusing your energies on providing your customers the best value you possibly can. One way to stand out from your competition is by trying to attract repeat customers. The thing is, you can fool a customer once but you won’t be able to fool him again. That is, once a buyer sees that you’re not willing to answer any questions or provide any kind of service to him or her after payment is made, they’ll never do business with you again. However, if you go out of your way for your customers and provide value to them, guess who they’ll turn to next time they want tickets to the next big show? That’s another sale for you. You might want to include a business card in your eBay envelopes, as this will encourage buyers to contact you for future events. Many online ticket brokers are addicted to email. They love it. And yes, although email is a great way to keep contact with your current customers, it’s not the best way to persuade potential customers. I’ll tell you a story to show you what I mean. 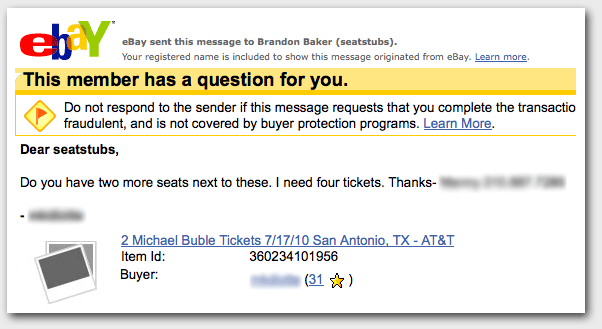 A few months ago, I had two pairs of tickets up for sale on eBay to a Michael Buble show. Interestingly, the two pairs were for the same show, same section, and even the same row: seats 8-9 and 12-13. I listed them as two separate listings, naturally. I blurred it out for privacy reasons, but if you look closely you’ll see that he left his name and cellphone number at the end of his message. Remembering that I also had Buble tickets in the very same row, just a few seats away, I jumped on the opportunity and called him immediately. He explained to me that he was really interested in my tickets but he was going to the show with his wife and two kids, so he needed four consecutive tickets. Of course, this is exactly what I wanted him to say, so I explained to him that if he bought my other two tickets, all he had to do was kindly ask the two people next to him if they wanted to trade seats, and voila. He agreed to buy the four tickets on the spot and paid me directly via Paypal. This was an added bonus because this avoided having to pay eBay’s 7% fee. All in all, I made $335.44 profit from those four tickets and all I had to do was pick up the phone. Most ticket brokers would have looked in their inventory and replied with an email saying they only have tickets in pairs. And even if they would have suggested my idea, the fact that the conversation is via email creates a delay, and during that delay, the buyer will be looking for better deals on eBay. You have to avoid that delay and be proactive. All of this happens because you’re focused on creating a positive experience for your buyer, not just filling your pockets. Sure, there are hundreds of ticket brokers out there right now making money selling tickets, but what customers really want is a good experience–not just during the show, but also before it. Ticket brokers get a bad reputation sometimes because disappointed fans tell horror stories of scalpers cheating them of their money and selling them counterfeit tickets and whatnot. this is such a great site, and this post was very helpful! I read your book. Really awesome and it was easy to read! thanks for this! Hello Brandon, I’ve heard that there’s a way to sell official TicketMaster tickets on eBay by emailing the info from the ticket to your buyer (i.e. Like the “Instant Download” from StubHub and like sites). Is this true? Thanks! Many ticket sellers limit the number of tickets that can be sold to one credit card holder or billing/shipping address. So having multiple credit cards is key. If you don’t, you can try borrowbusinesscredit.com or another “rent-a-credit-card” service.